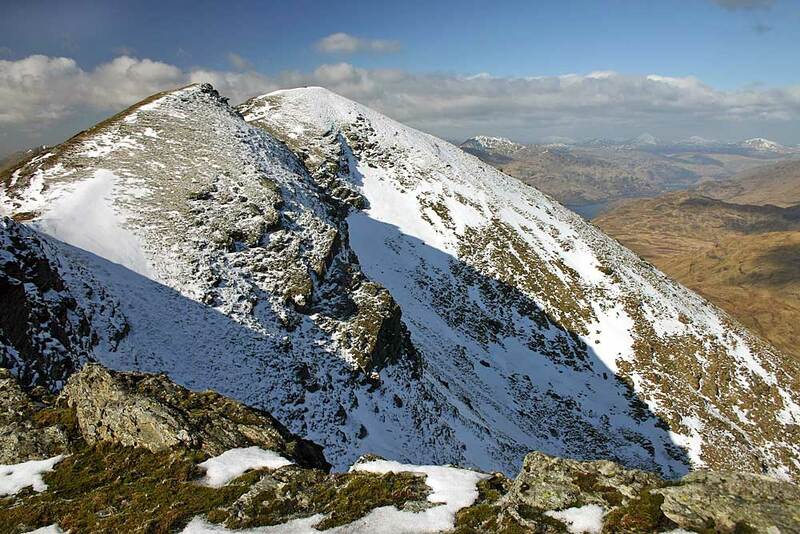 ​Ben Lomond (974m) is Scotland`s most southerly Munro and is one of the best known geographical features within the boundaries of the National Park. 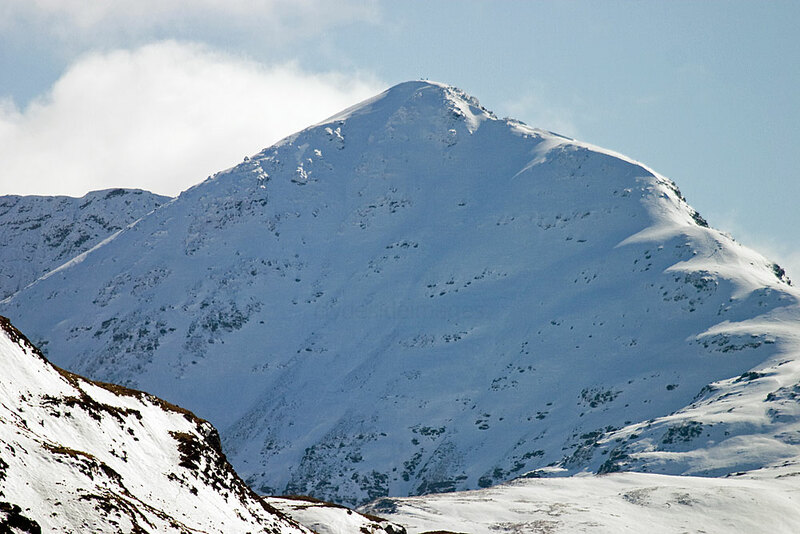 in addition to what is probably Scotland`s most famous mountain there are another 20 Munros and the same number again of Corbetts as well as numerous low-level scenic walks through a wide variety of terrain. 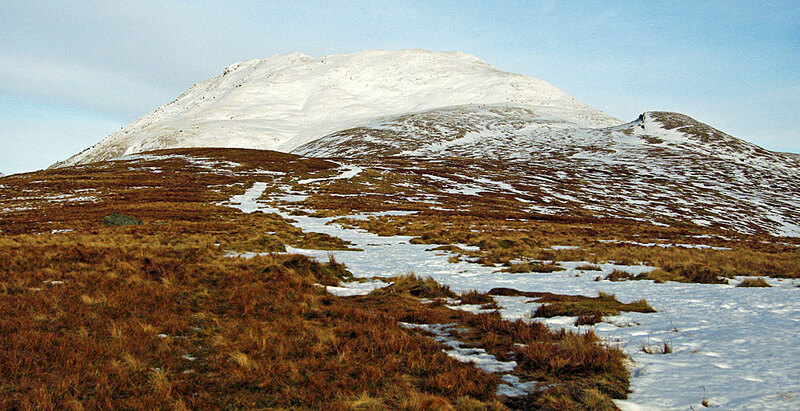 The name Ben Lomond literally means Beacon Hill, and was probably attributed due to the mountain`s prominence, standing as it does within 25 miles (40km) of Glasgow city centre, with its instantly recognisable summit profile also visible from a large area of Central Scotland. The usual starting point for this ascent is the car park at Rowardennan where the road along Loch Lomond`s eastern shore ends. The clearly marked path begins immediately behind the small Information Centre (with public toilets) and leads initially through natural woodland, then crosses a forestry track before climbing to a gate which gives access onto the open hillside. 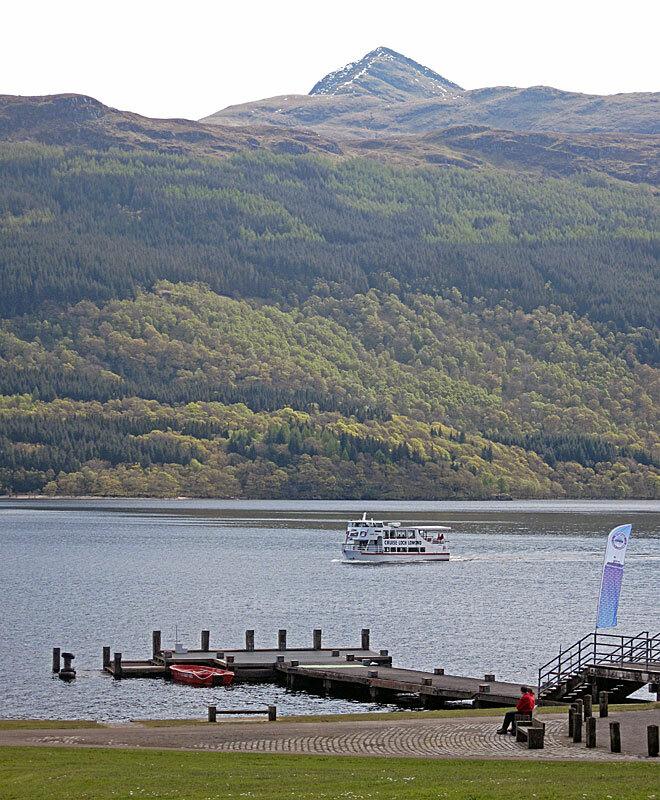 A ferry service runs from Inverbeg, on the west shore of the loch to Rowardennan between April and September. Enquire at the Inverbeg Hotel for sailing times. ​Before setting off on the climb it is worth wandering over to the striking memorial at the water`s edge. 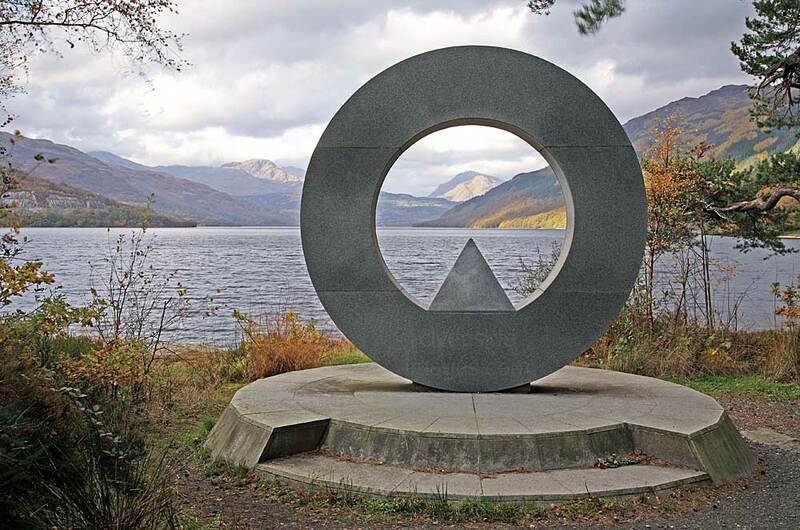 The granite sculpture, by Scottish artist Doug Cocker, acts as a focal point for the Ben Lomond National Memorial Park, woodland established to commemorate those Scots who laid down their lives during the Second World War. 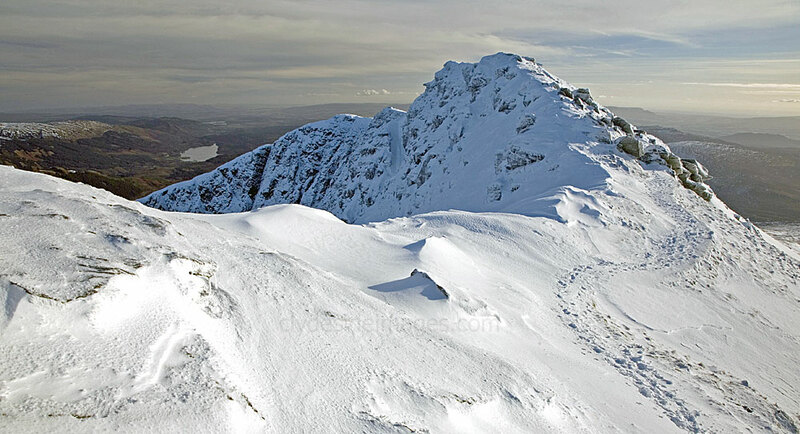 Ben Lomond is a magnet for day-trippers, families and tourists due to its proximity to the major population centres including Glasgow and as a result is one of the most-visited summits in Scotland. The volume of walkers has left the hillside badly scarred and continuous efforts are made to combat erosion and maintain the Tourist Path, which was upgraded in the 1990s. 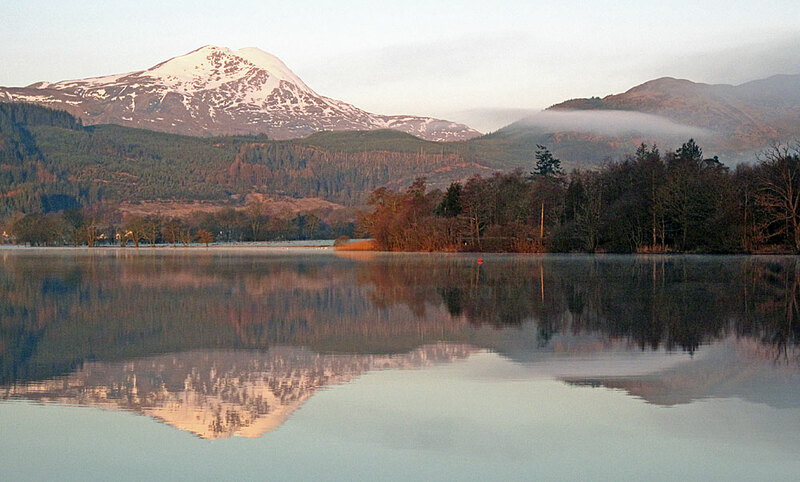 Ben Lomond from Loch Ard in The Trossachs. I`ve climbed Ben Lomond many times over the years, always from Rowardennan but a less popular and more challenging ascent can be made from the north where a bulldozed track leaves the West Highland Way south of Inversnaid beside abandoned Cailness cottage (below) and climbs the hillside several kilometres north of the target peak. Thereafter the going is rough and pathless. 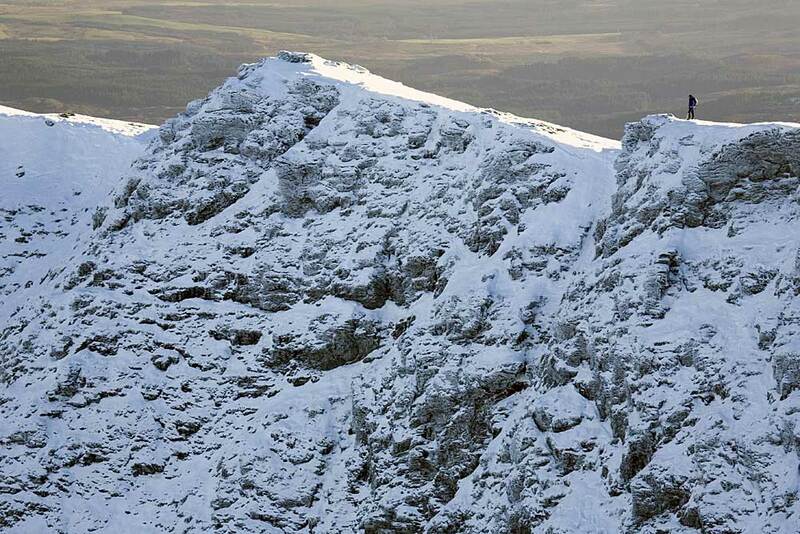 Ben Lomond`s summit block is surprisingly rugged with cliffs forming its northeast corrie, Corie a` Bhathaich. 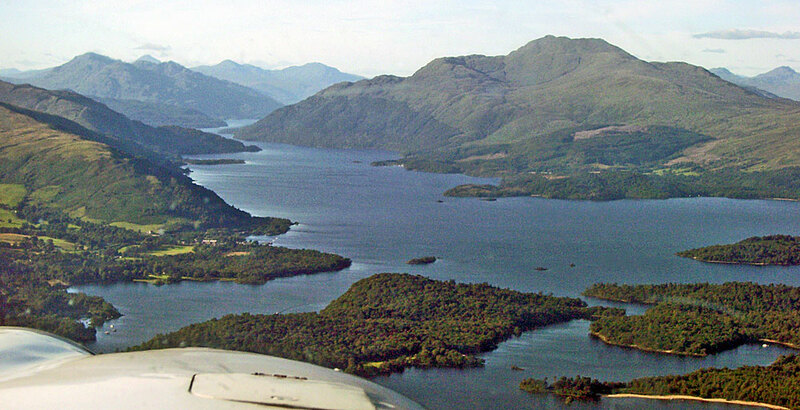 To the south, weather permitting, there`s a birds-eye view of the southern end of Loch Lomond, including the heavily-wooded islands of Inchcailloch, Creinch, Torrinch and Inchmurrin, which form part of the Highland Boundary Fault, which marks the southern limit of glacial expansion at the end of the last ice-age. ​Across the loch to the west the Arrochar Alps and in particular the jagged outline of the Cobbler catches the eye. A Royal Navy Sea King from HMS Gannet at Prestwick flies over the summit of Ben Lomond on a fine day in January 2008. Responsibility for airborne mountain rescue operations has since passed to HM Coastguard. 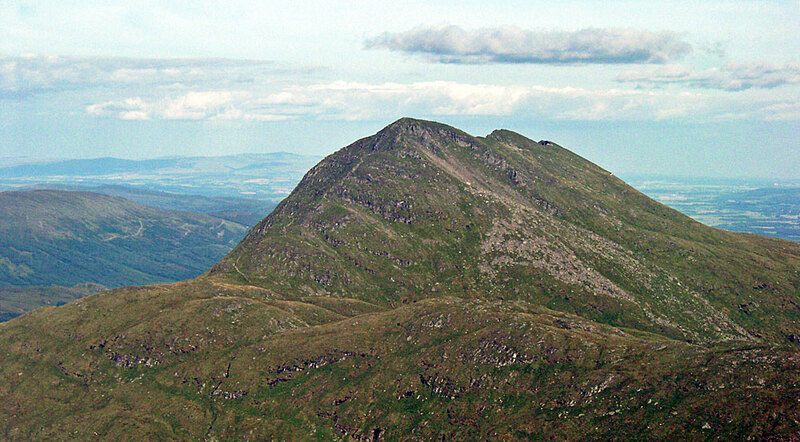 Above: ​Looking north from Ben Lomond`s summit: The prominent snow capped peaks right of centre are Stob Binnein and Ben More. 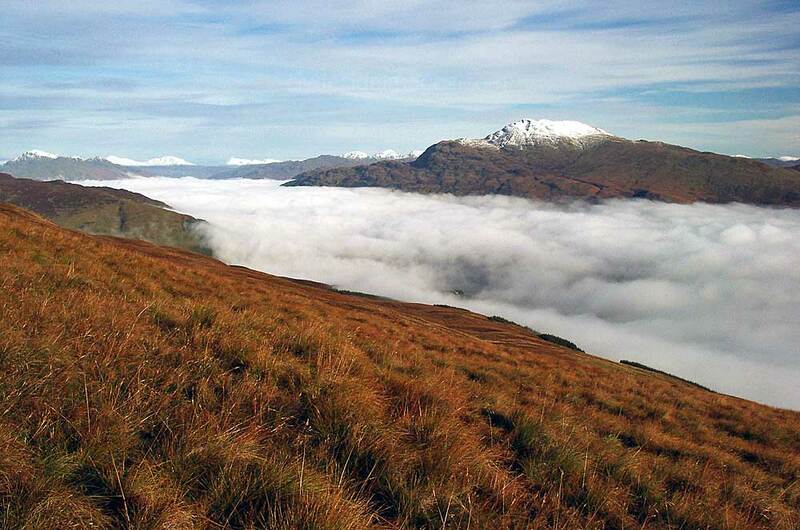 ​Above left: Looking south from the corrie rim close to Ben Lomond`s summit. 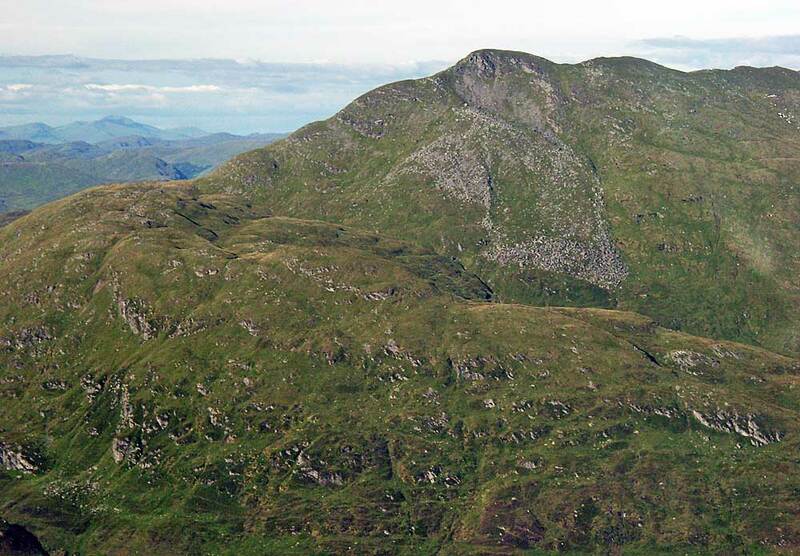 The view on the right, taken from the hills above Inversnaid to the north, shows the sheer cliffs on the north-western face of the mountain. Although hard to make out in this low-res shot, several walkers are at the top beside the cairn. 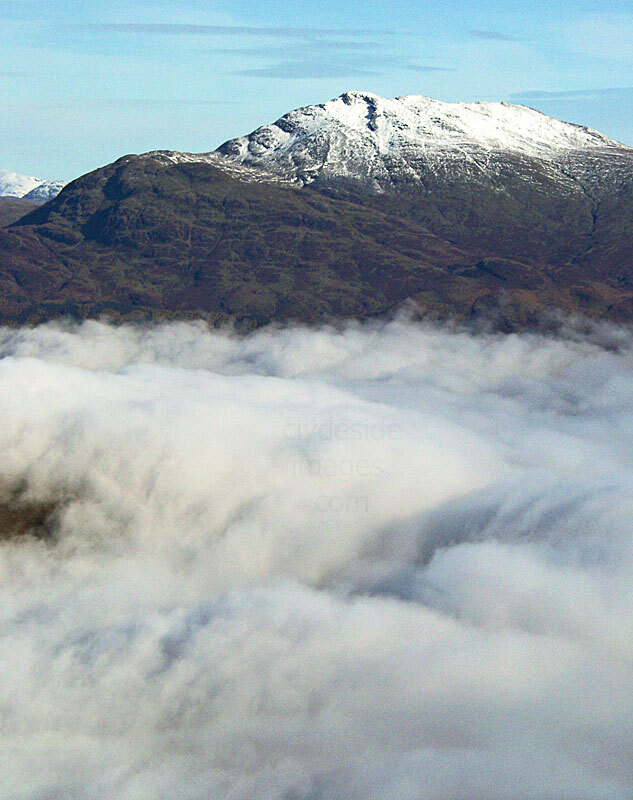 I took this aerial shot of Ben Lomond`s upper reaches from a light aircraft many years ago. A distant view of Ben Lomond from Fynloch Hill in the Kilpatricks. Rather than retracing the route down the Tourist Path (above) to Rowardennan, a descent via the Ptarmigan Ridge (below) makes an interesting circuit. 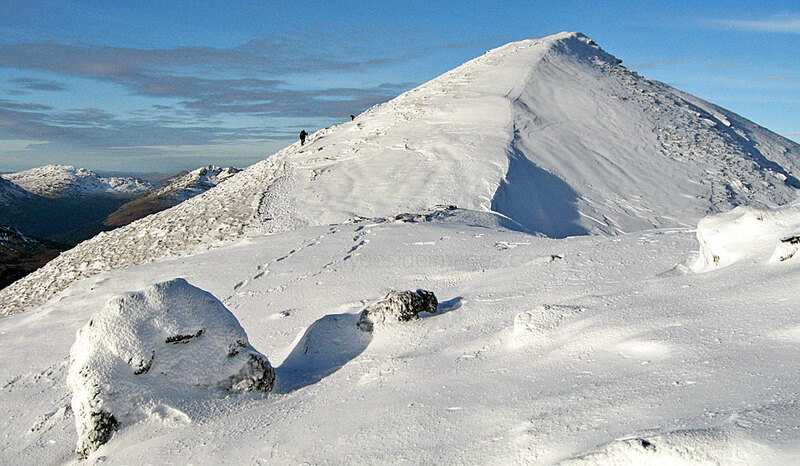 The Ptarmigan route leads off down the steep north-west ridge, with two rocky but straightforward sections to negotiate, before joining the Ptarmigan path proper where it winds along the knobbly ridge, passing a small lochan just before reaching the high point (731m) that gives the ridge its name. 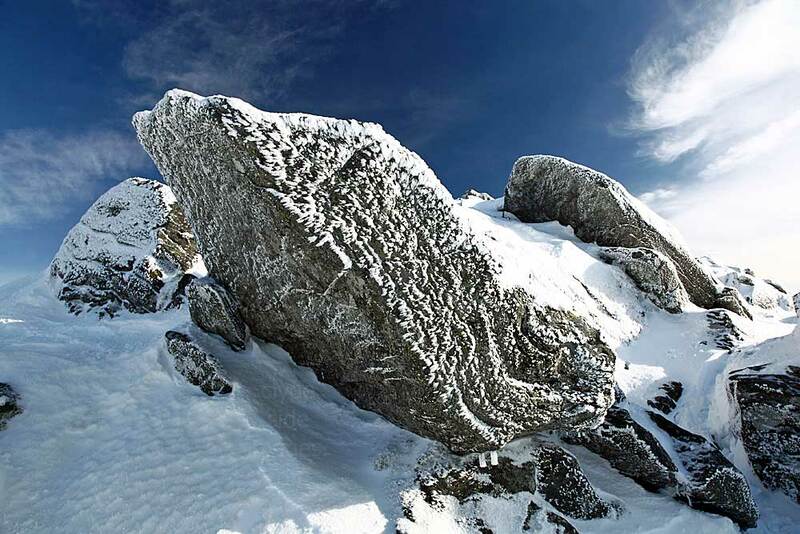 ​Although this route is not difficult it is initially far steeper than the Tourist Path and requires care, especially on the descent, and proper winter equipment and experience if snow or ice are present. The path eventually leaves the ridge behind and continues towards Rowardennan. Scraggy feral Goats frequent the lower slopes and are occasionally encountered. The path joins the West Highland Way near the loch-side, approximately 1km north of the car park. 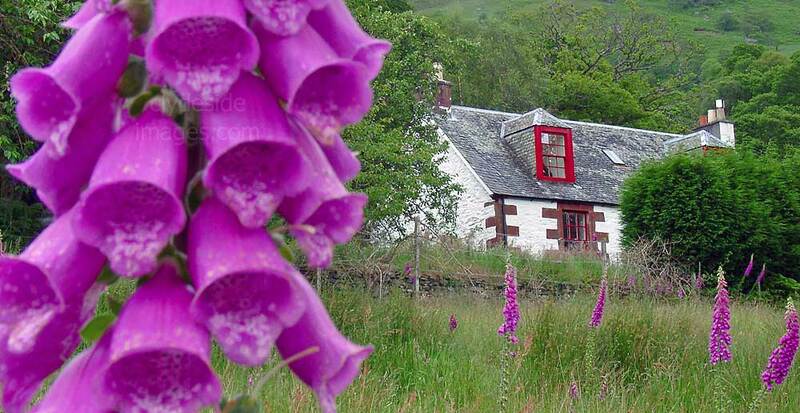 A left turn will take you past the turreted Rowardennan Youth Hostel, which was once a shooting lodge and a final loch-side stroll will return you to the starting point. Another view of Ben Lomond from Loch Ard.